Scientists around the world are worried about what Jair Bolsonaro might do. 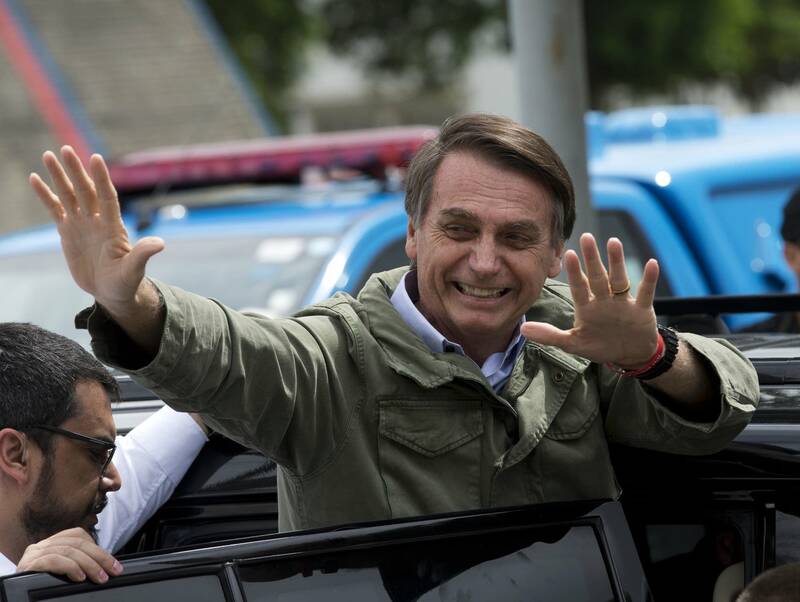 The right-wing president-elect of Brazil, who campaigned with a pledge to "make Brazil great," has policy priorities critics say will hasten global climate change and increase violent acts against environmental protectors. Most of the Amazon rainforest sits in Brazil's borders, which gives its government great power. "Any decision that's made by Brazil's government is going to have implications that extend far beyond Brazil's borders," said Emilio Bruna, a University of Florida ecologist. Bolsonaro plans to combine the country's environment and agriculture ministries as president. Critics say this, among other policies, would catalyze further deforestation and put the rainforest at greater risk. Typically, large forest areas are considered "carbon sinks" — meaning the plants and soil clean the air by removing carbon dioxide, a planet-warming greenhouse gas, and storing it. Deforestation throws that all out of balance. Research shows many tropical forests are now sources of carbon emissions, producing more greenhouse gases than they can absorb. The Amazon forest is also responsible for producing a lot of rainfall — over 20 percent of rainfall in the Amazon is generated by trees themselves, Bruna said. Cutting down trees not only increases carbon emissions, he said, but it also makes a drier forest that's more susceptible to spreading fires from nearby agricultural areas. "You get into this negative feedback loop where you have forests drying out, fires getting in, forests continuing to dry out, trees continuing to dry, becoming more susceptible to fires again, and going on into this negative spiral that really has long-term implications," Bruna said. There's no disagreement in the scientific community that deforestation will accelerate climate change, Bruna said, and indigenous communities play a big role in preventing deforestation. It becomes clear when looking at satellite images of the rainforest. "Up until [the location of indigenous communities] you've got lots of deforestation and lots of fragmentation of the rainforest," Bruna said. "But past that line, it's continuous forest all the way through." Bolsonaro has favored businesses in his land use policy and has said his administration wouldn't further protect indigenous land. Bruna and other scientists and observers are concerned Bolsonaro's election could increase potential for more attacks on indigineous activists, environmentalists and journalists covering the environment or human rights. "I really feel that those people are going to be emboldened by this president's words and actions and that they're gonna act in really violent ways because they know they're not going to be held accountable for it," Bruna said. With 57 murders in total, Brazil was the deadliest place on earth for environmental and land defenders last year, according to Global Witness, an international human rights and environment watchdog. Last year, there were "violent attacks by Brazilian farmers, using machetes and rifles, which left 22 members of the Gamela indigenous people severely injured, some with their hands chopped off," Global Witness said in a statement. The greatest number of killings Global Witness analyzed were linked to the agribusiness industry. Killings related to the mining and logging industries weren't far behind, Global Witness found. All three industries exist in the Brazilian rainforest. Use the audio player above to hear the entire Climate Cast segment, including an interview with Emilio Bruna and a Climate Voice from Melissa Hotstettler with Gale Woods Farm.